Very Enjoyable Way of learning Italian! 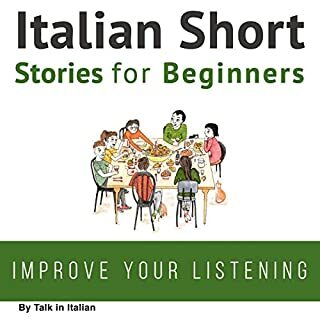 What did you love best about Italian Short Stories for Beginners? I have always been interested in learning Italian and I feel as if these short stories are the perfect way to dive straight into the Italian language. This audio book was easy to follow and is convenient to listen to on a drive or waiting around. It's the perfect length of time to fit in learning daily. I love the idea of using an audio book for learning so that you can hear the exact pronunciation of words in their language versus trying to learn from a book.The audio flashcards were also very helpful in the repetition of learning certain words. I would suggest going through these a few times if you are a true beginner. I found this to be a very enjoyable way of learning the Italian language.